Bioinformatics at large. The ISMB conference is a big event and summarizing seven parallel sessions requires additional channels than physical presence. Luckily, there is the Internet. A sufficient number of scientists report of the current session on social media tools like Twitter. In previous years, the conference was supported by FriendFeed but the slow demise of the platform no longer made it possible. Following a conference on Twitter can be hard. You need to get accustomed to the use of hashtags and learn who actually wants to contribute and who’s in for self promotion. You can follow the ISMB for a limited time only. 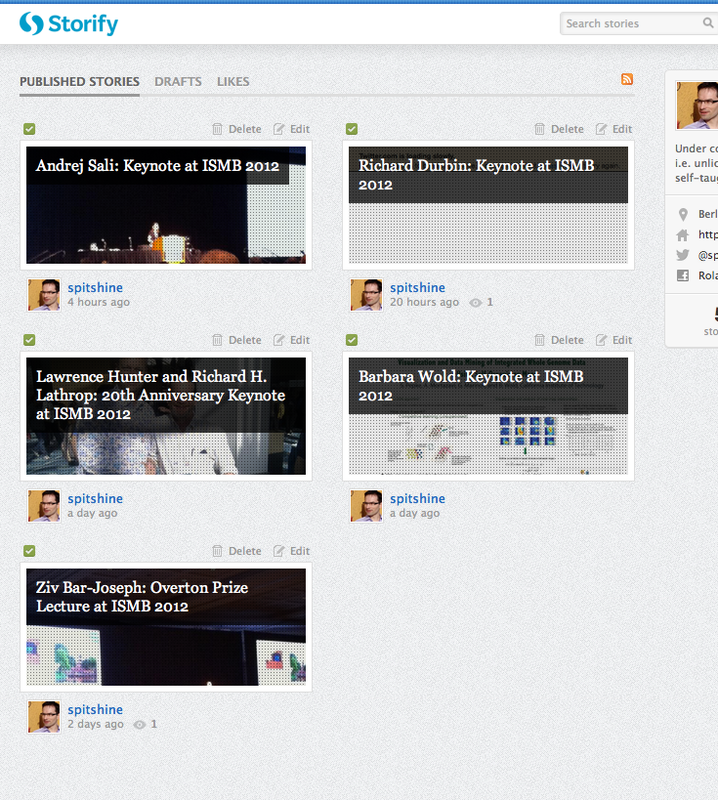 For ease of access and preservation, I compiled the keynotes of this year’s ISMB using Storify. The opening keynote, celebrating 20 years of “Intelligent Systems for Molecular Biology” – the title is not often used, particular when talking to intelligent molecular biologist – was our first try and might be little dry. Ziv Bar-Joseph‘s and Barbara Wold’s lectures nicely framed the aspects from hard statistics to experimental aspects. Bar-Joseph received the Overton prize for his contributions to the field as a young scientist. Richard Durbin discussed the progress in the large 1000 genomes projects, it’s second phase now aiming at 1700 genomes covered at 4x. The large scale structural biology story of the structure of the 26S proteasome by Andrej Sali was best covered so far. The final keynote by Gunnar van Heijne will be added here, I will be traveling to the airport. All meetings large and small benefit from social media coverage. A few simple steps in the planning of the meeting will help. Decide on and publicize hashtag. The ISMB simply used #ismb and promoted every session with a short tag that was previously used for organization. Make sure you conserve your tweets to trace the coverage later. The set up costs are minimal and even the smallest meetings get worldwide coverage. If you have a critical mass of people, you can augment the coverage, not only by transcripts but also by catching the mood. This entry was posted in 2012, Bioinformatics, Meetings and tagged ISMB, twitter. Bookmark the permalink.